For other uses, see Golden Triangle. Along with Afghanistan in the Golden Crescent, it has been one of the most extensive opium-producing areas of Asia, and of the world, since the 1950s. Most of the world's heroin came from the Golden Triangle until the early 21st century when Afghanistan became the world's largest producer. Myanmar is the world's second largest producer of illicit opium, after Afghanistan and has been a significant cog in the transnational drug trade since World War II. According to the UNODC it is estimated that in 2005 there wеrе 430 square kilometres (167 sq mi) of opium cultivation in Myanmar. The surrender of drug warlord Khun Sa's Mong Tai Army in January 1996 was hailed by Yangon as a major counter-narcotics success. Lack of government will and ability to take on major narcotrafficking groups and lack of serious commitment against money laundering continues to hinder the overall anti-drug effort. Most of the tribespeople growing the opium poppy in Myanmar and in the Thai highlands are living below the poverty line. In 1996, the United States Embassy in Rangoon released a "Country Commercial Guide", which states "Exports of opiates alone appear to be worth about as much as all legal exports." It goes on to say that investments in infrastructure and hotels are coming from major opiate-growing and opiate-exporting organizations and from those with close ties to these organizations. A four-year investigation concluded that Myanmar Oil and Gas Enterprise (MOGE) was "the main channel for laundering the revenues of heroin produced and exported under the control of the Myanmar Army." In a business deal signed with the French oil giant Total in 1992, and later joined by Unocal, MOGE received a payment of $15 million. "Despite the fact that MOGE has no assets besides the limited installments of its foreign partners and makes no profit, and that the Myanmar state never had the capacity to allocate any currency credit to MOGE, the Singapore bank accounts of this company have seen the transfer of hundreds of millions of US dollars," reports François Casanier. According to a confidential MOGE file reviewed by the investigators, funds exceeding $60 million and originating from Myanmar's most renowned drug lord, Khun Sa, were channeled through the company. "Drug money is irrigating every economic activity in Myanmar, and big foreign partners are also seen by the SLORC as big shields for money laundering." Banks in Rangoon offered money laundering for a 40% commission. The main player in the country's drug market is the United Wa State Army, ethnic fighters who control areas along the country's eastern border with Thailand, part of the infamous Golden Triangle. The UWSA, an ally of Myanmar's ruling military junta, was once the militant arm of the Beijing-backed Burmese Communist Party. 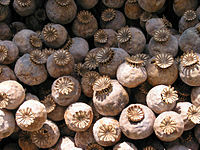 Poppy cultivation in the country decreased more than 80 percent from 1998 to 2006 following an eradication campaign in the Golden Triangle. Officials with the United Nations Office of Drugs and Crime say opium poppy farming is now expanding. The number of hectares used to grow the crops increased 29% in 2007. A United Nations report cites corruption, poverty and a lack of government control as causes for the jump. Opium and heroin base produced in northeastern Myanmar are transported by horse and donkey caravans to refineries along the Thailand–Burma border for conversion to heroin and heroin base. Most of the finished products are shipped across the border into various towns in North Thailand and down to Bangkok for further distribution to international markets. In the past major Thai Chinese and Burmese Chinese traffickers in Bangkok have controlled much of the foreign sales and movement of Southeast Asian heroin from Thailand, but a combination of law enforcement pressure, publicity and a regional drought has significantly reduced their role. As a consequence, many less-predominant traffickers in Bangkok and other parts of Thailand now control smaller quantities of the heroin going to international markets. In recent years, the production has shifted to Yaba and other forms of methamphetamine, including for export to the United States. The Chinese Muslim Panthay are the same ethnic group as the Muslims among the Chinese Chin Haw. Both are descendants of Chinese Hui Muslim immigrants from Yunnan province in China. They often work with each other in the Golden Triangle Drug Trade. Both Chinese Muslim and non-Muslim Jeen Haw and Panthay are known to be members of Triad secret societies, working with other Chinese groups in Thailand like the TeoChiew and Hakka and the 14K Triad. They engaged in the heroin trade. Ma Hseuh-fu, from Yunnan province, was one of the most prominent Jeen Haw heroin drug lords. Ike Atkinson, former US Army sergeant and convicted drug trafficker, thought to have been a major figure in smuggling heroin into the United States from about 1968 to 1975. Buddha's Lost Children, 2006 documentary film about a Buddhist monk helping orphaned children in the Golden Triangle area of Thailand. Anthony Poshepny, US Army officer who accused the Laotian Major General Vang Pao of using the war, and CIA assets, to enrich himself through the opium trade. ^ "GOLDEN TRIANGLE". Tourism Authority of Thailand (TAT). Retrieved 4 April 2018. ^ O'Riordain, Aoife (22 February 2014). "Travellers Guide: The Golden Triangle". The Independent. Retrieved 4 April 2018. ^ a b "Afghanistan Again Tops List of Opium Producers". The Washington Post. 4 February 2003. ^ Gluckman, Ron. "Where has all the opium gone?". Ron Gluckman. ^ "Facts and figures showing the reduction of opium cultivation and production...". Embassy of the Union of Myanmar in Pretoria. 23 October 2005. ^ a b Bernstein, Dennis; Leslie Kean (16 December 1996). "People of the Opiate: Myanmar's dictatorship of drugs". The Nation. 263 (20): 11–15. Archived from the original on 1 June 2004. Retrieved 2008-07-06. ^ Alexander Cockburn; Jeffrey St. Clair (1998). Whiteout: The CIA, Drugs and the Press. London: Verso. p. 230. ISBN 1-85984-139-2. ^ Bouchard, Chad (12 October 2007). "Opium Cultivation Blossoms in Myanmar". Voice of America. ^ "Chapter III Part 1: Drug Trafficking and Organized Crime". America's Habit. Schaffer Library of Drug Policy. 1986. ^ a b c Bertil Lintner (1999). Burma in Revolt: Opium and Insurgency Since 1948. Chiang Mai: Silkworm Books. p. 306. ISBN 974-7100-78-9. Retrieved 12 April 2011. Wikivoyage has a travel guide for Golden Triangle. Geopium: Geopolitics of Illicit Drugs in Asia. Geopium.org (since 1998) is the personal website of Pierre-Arnaud Chouvy, CNRS Research Fellow in Paris. Kramer, Tom, Martin Jelsma, and Tom Blickman. "Withdrawal Symptoms in the Golden Triangle: A Drugs Market in Disarray". Amsterdam: Transnational Institute, January 2009. ISBN 978-90-71007-22-4.